As an internationally trained engineer, how can you use your skills and qualifications in the United States? This e-guide provides resources and guidance to internationally trained immigrants seeking to use their foreign education in the United States. 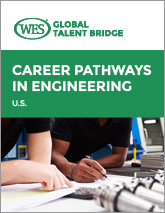 It explores career pathways related to engineering and more general careers in the field of engineering, as well as alternative careers that may not require a license. © 2018 World Education Services. All rights reserved.